The question is scars, imprints, and things that last. Sure, life moves on, and our past is behind us, but there is no escape from what has happened to us. Experiences will live with us forever, because I believe e-v-e-r-y-thing makes an impact, no matter the size, on who we become. Which is why no one event is the sole cause of something. There were many things that led to it. I’ve been thinking about this because of the possibility that I might get better. I’m sick, and as the title will tell you, sick of it. But I might get better, so I try to focus on that. Whenever I think of my future, when I imagine my grown-up self, when I dream up a family, I’m always healthy. I never let myself think about what life would be like if I don’t get better very soon. I don’t let myself think of when I finish high school, how I’ll never be able to date if I’m sick, or how I’ll dance at my wedding with this body of mine, or how I won’t be able to sit on the floor with my kids, or how I won’t be able to show them how to do cartwheels, or…. But really, even if I do get better (/when), will this disease ever really leave me? What scars have my life cut into my heart, that will debilitate me for eternity? Wow, dramatic sentence. 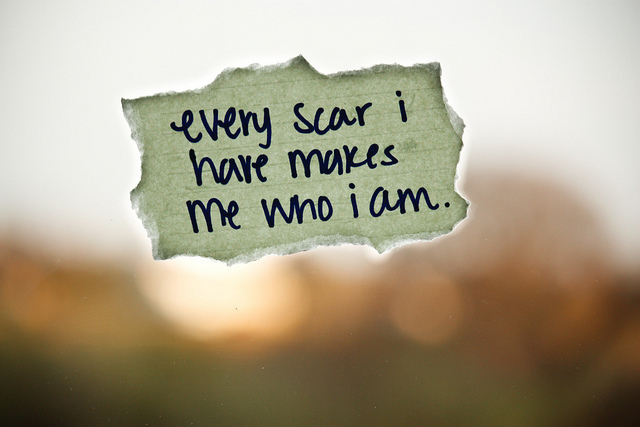 Every phase of my life has left me with scars, and has helped shape who I am. But where is the balance, between the scars shaping us, and our personalities shaping us? And really, is there that much of a difference? I don’t think so. I believe that our scars are what make us who we are. But the same event, happening to two different people, will cause different scars, and ultimately, a different outcome. I was bullied, starting from age seven, and because of that (and many other things), I take special care to never hurt anyone’s feelings (because Anyone has an almighty power and if I insult him he’ll kill me). I look out for those who have trouble doing it themselves, and most importantly, I’ve learnt how to take care of myself so I don’t get hurt again. But others who have been in my position have turned to bullying others in return. What does that mean? I don’t know. That’s why I’ve been wondering, and why I’m writing it down. I feel like I’ve thought this through about 90% of the way, and those ten percent are what is really important and what I haven’t gotten to yet. Writing things down usually helps me figure everything out, but not this time, I guess. Maybe it just needs more time. It’s not like my scars are ever going to leave me. They stay. From now on, don’t abandon your scars. The would never abandon you. This entry was posted in Deep Thinking and tagged Bullying, Chronic pain, Conditions and Diseases, Coping, Dream, Fibromyalgia, Future, Health, hopes, Nate Ruess, pain, Pink, Quote, Scar, Wondering, Worry, Youth. Hi Ella, great post and deep insights. I love the quote in the pic – I’ve been searching for who said that quote. Was it Maya Angelou? Ella, you are a beautiful writer. I enjoy reading what’s on your heart :) I too have FMS and also CFS. I know how hard it is to have a “things you can’t do” list that’s a million times longer than the “things I can do” list. I suffered for decades until I finally got a diagnosis of Celiac Disease and went gluten free. It has helped me so much. I still have bad days on occasion and there are some things that will never get better because of damage done but overall I’m a lot better. Maybe some food for thought or maybe you’ve already explored that route. But I thought it was worth a mention :) Anyway, you are a very talented young woman! Hi :) I also suffer from Fibromyalgia, and I empathise with everything you’re saying, about how difficult some days can be, and how “old” you feel when you’re meant to be out enjoying yourself. It’s ‘logically odd’ to have an emotional impact from reading something a stranger has written, but that’s what happens when we read. With blogs, we can comment, and say thank you for it. I can certainly empathize with what’s bubbling in your brain, because I’m human, and humans can do that. But, something you wrote stuck out at me, regarding your future vision of yourself being very different from reality now. My Mother, for instance, has had M.S. for most of her adult life. She’s coped quite well in consideration of her circumstances, but I’m certain that in her own mind, her life hasn’t been as she would imagine it. However, impact: Watching her efforts and struggle to cope with her own ordeal; watching her capacity to simultaneously offer a deluge of love to my Sister and I with nothing but grace? That is actually something very inspiring now that I’m an adult myself. It makes a little comment about what real strength is. Impact of that? : The harder something is, the more worthwhile it is to do it. My best to you, your struggle, your coping, your journey. I hope you keep writing. I have battled with this concept many nights.